Directly Across from Indio Larson Justice Center Court House and the Brand New John J. Benoit Detention Center. After years of planning, Riverside County supervisors signed off on a $330.35 million plan to add more than 1,200 beds to the county’s chronically crowded jail system. The project will replace an existing 353-bed jail with a state-of-the-art facility with room for more than 1,600 inmates. Classroom space and rehabilitative programs will be part of the new jail, which will be at the corner of Highway 111 and Oasis Street. In all, the county will spend close to $400 million on the jail and related improvements, including an 832-space parking garage in downtown Indio. This will bring 400 new jobs and many visitors to the site. College of The Dessert – 45524 Oasis St., Indio. 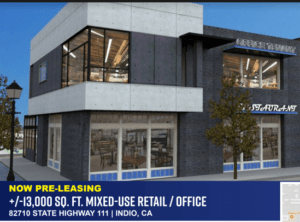 Currently in the process of expanding their presence in downtown Indio by doubling their campus with a second building that will accommodate approximately 4,200 additional students. Loma Linda University Children’s Hospital – Indio Outpatient Pavilion is close to opening. Located in the center of downtown Indio, which is just east of City Hall. Other prospective development projects are being discussed.